Here is a commented EURUSD chart for a change. ES and ER are certainly largely correlated hence it is always worth reading both reports (ER report just below). However information is sometimes clearer on either ES or ER. 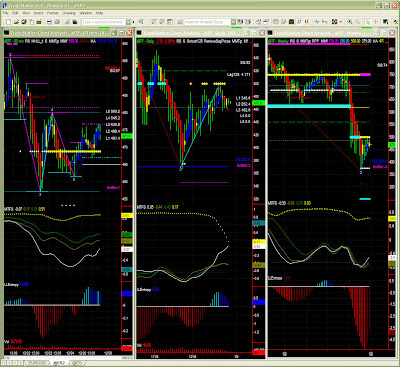 ES 60mins: Upper bias with clear strong resistance on 875. MTFS pattern is only mildly bullish so if anything, we are very likely to see a test of that level as a support before going higher then. Our chart also provides prospective Fib targets (882, 900, 930) which should mark the way to recovery in January. ES Daily: Prices have been hovering a little directionless lately, and MTFS is indicating some consolidation. It is however difficult to read markets correctly with such low volumes and the significance level is low. We shall therefore only reiterate how strong resistance level has been (~920) and rather follow action on the 60mins chart or even bettern on volume charts (16000V and 32000V). ES Weekly: No change from last week, and similar to ER: Swing is up and Entropy has bottomed yet MTFS is not too bullish so one does not anticipate any significant take off, and after all one has already enjoyed a significant 25% recovery since recent lows, so a pause and some profit taking would be quite in order. Dominant TF: 60mins leading, with Daily dropping lately. 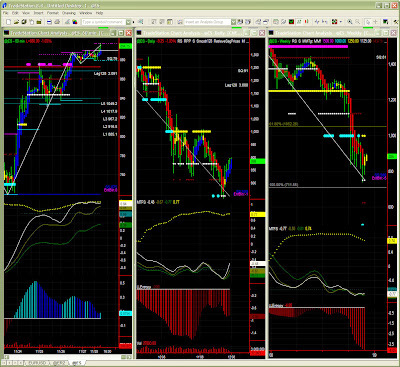 Market Direction(daily): preferably flat, or tight stops at this time frame. EURUSD: last week, we indeed saw a retracement to ~1.39 on Monday which quickly proved to be a very strong support, from which the US$ started weakening. Those who followed our recommendation to sell the US$ must be smiling. We probably also have had a bit of luck as the fall of the US$ may however have been exacerbated by lack of volume inducing the US$ to lose ground without much resistance. The long term trend is in any case clearly indicating a return to the high 1.40s (or even higher) but this last spurt above 1.41 should technically only be a short term spike before settling below or at the MM resistance level (~1.4146). ER 60mins: ER has been a little erratic at this time frame, yet we still have an upper bias hence a breakout is always possible even if there is very little energy right now. Lack of volume can also make market reading a little tricky. Those who wish to trade intraday in equivalent intervals should turn to 16000V bars for instance. ER Daily: At this time frame, we see buyers resting rather than actively besieging the 500 barrier. This is typical of this time of the year, yet we may see surprising moves this week. At the moment, the time frame is clearly not the dominant one and MTFS is very difficult to read so we'll remain on the sideline or very careful as the situation is definitely affected by lack of energy and lack of volume. ER Weekly: No change from last week (cf. report Monday 22nd). Entropy certainly looks a lot better but MTFS had an early crossover generally indicating a failing recovery hence should pull back before going higher later on. Like mentioned last week, buyers can maybe wait a little longer, or enter preemptively on an aggressive limit price or wait for a consolidation and buy market later on. You would have noticed my word of warning yesterday. Obviously the ongoing volatility again exacerbated the downward retracement, this making clear swings which were easy to trade in lower intraday time frames. EURUSD: We have a Fib pattern forming, but little chance it fully expands in the short term. We have to wait it first breaks the triangle pattern, and there is too little energy right now. On the Daily chart, a retracement to Fib PR1 (~1.38) is technically our favourite scenario, but that target was almost hit on Friday already. Wierd movement, wasn't it ? It is now difficult to pinpoint where support level will consolidate this current retracement to then go higher. Maybe a good advice to stick to lower time frames. ER: Retracement to Fib PR2 leads the way to a Fib expansion back to the 480s then close to 500. Somehow, it isn't clear yet whether there will still be enough energy to fight the level though. This time of the year, some traders may have the Christmas bonus in mind as an incentive, but most are by the fireplace waiting for warmer days. Longer term, i.e. early January? we should see some interesting action and behaviour around 500 remains paramount to determining market's mood. ES: Yesterday's actual support level almost surprised us late in the trading day. We're now back to that 875 pivot level from which ES can really go either way. Since recovery happened with low volume, another look at volume charts is necessary here. Volume charts are great (32000V are equivalent to a 5 to 15 mins chart). Vol chart shows us an upper bias to 875, and maybe higher to 885 right now. Obviously they are not compatible with a daily report. 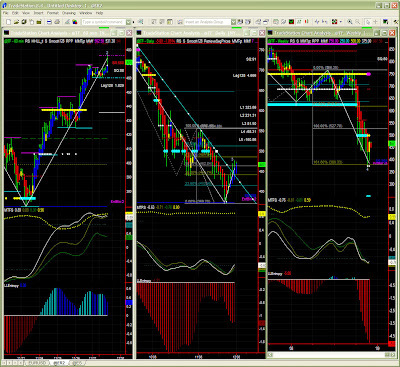 Market Direction(daily): cautiously long or taking profit. Last week monday, we were long while we anticipated the energy exhaustion ahaead of the 500 level. A fairly easy week overall except we had to remain cautious ahead of triple witching. Now comes the festive season with lower volumes, a bit of position squaring writing off losses by Dec 31st, so we can expect again some volatility ahead. EURUSD: last week, i really thought €/$ would calm down before marching higher, but we remained positioned long and quite amazed by the $ freefall. EURUSD finally pulled back on 1.47 almost exactly on MM SR level, so again our indicators do react well even if again volatility acts as a time compression. Everything happens a lot quicker these days. At this stage, we should see some slow down possibly around 1.37 (retracement stopped on stall level ~1.38), but the overall direction has now changed, and we shall either see a range shift i.e. same dynamics just shifted upwards due to rate cuts, or a continuation of the fall. We are for the time being waiting to check EURUSD behaviour on salient support/resistance levels before updating our scenario. 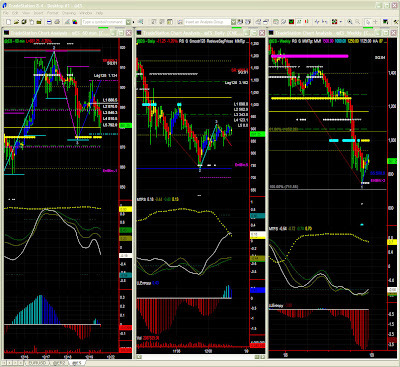 Our short advice would be to sell the US$ following the 60mins charts as well as tick charts. Upward potential is however limited. ER 60mins: surprisingly little difference from last week. ER is still inches away from the 500 target, and finds it difficult to go higher. It is only a matter of time though even if there is still a possibility to see ER consolidating around 470. Here as well shorter time frames are recommended to possibly buy in dips (dominant trend is up). ER Daily: upper bias weakening here too. Momentum trading should take ER to 500 and even maybe to PR1 around 520, but difficult at this stage to figure out whether we shall then see new energy coming from a breakout effect or another pullback. The latter scenario is preferred, hence caution must be exercised. Those who are still long can tighten their stops, otherwise it is probably too late to enter except on a stop entry above 500 (risky). ER Weekly: With Entropy bottoming out, we now look at the MTFS pattern and realize that while it does show some recovery potential (+33% from recent lows), there very little chance to see ER going much higher. 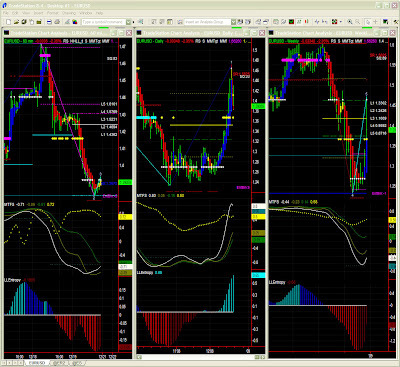 Logic would say selling would start on key MM or Fib level, as mentioned above on lower time frames. This is a time of uncertainty so buyers should look at buying on an aggressive limit price or wait for a consolidation and buy market later on. EURUSD: Our chart seems to indicate some calming down today as with some conflicting forces now brewing. 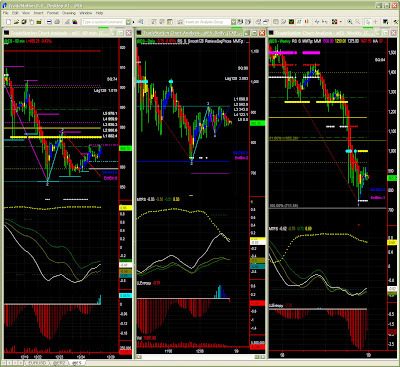 It is difficult to pick a direction for the day, however the oversold situation should push the US$ down. A shorter time frame is recommended. Longer term, the US$ will definitely weaken further. ER: Yesterday's dip should not have any lasting effect on prices slowly rising to test the almighty 500-520 zone. We do have a slowdown in energy, but this could be understandable hesitation on triple witching day. We expect a clearer picture later on today although volumes could be turn a little lower ahead of the festive season. ES: Similar scenario at first sight, if only one wouldn't see a more definite exhaustion in the short term. One might therefore test lows near 875 again where one could then possibly gather some strength. Overall, we see little chance of a rally coming. On the contrary, we might just be heading toward some drifting til the end of the year. More details in the weekly report this weekend. Lull before another storm ? Sorry i couldn't make it yesterday but i had no connection available 39000 feet a.s.l. Fantastic action on EURUSD, with a dollar in a near free fall after the rate cut. At least we all know it should be the last one... :) The effect on indices has been minor overall. EURUSD: short term, stall level is now around the corner just above 1.45, but we have a stronger resistance level around 1.462 to 1.464. The daily MTFS shows that we are entering profit taking zone, so we'll watch carefully for a reversal on the 60mins chart or below to take profits or at least tighten our stops. ER: 481-484 was a reasonable target area, where we could see some mild profit taking ahead of the 500-506 major target zone. The daily chart shows a pennant or rising triangle pattern* which is not a clear bullish signal in the short term. We still have substantial conflicting forces even if we will eventually reach the low 600s in a matter of weeks. ES: similar story again. Our target levels here are low 920s which ES almost hit yesterday. It may get there today despite some uncertainty visible from the mild profit taking seen late in the day. Over the next few days, one could see a pullback (MTFS line separation on the daily chart) but we shall only keep that info at the back of our mind since the 60mins time frame dominates by far. Last week's report may have sounded confusing in a way as i clearly indicated a breakout situation while a pullback was also expected. Volatility indeed exacerbated swings on 60mins and lower time frames, and the retracement actually reached PR2 to the 840s even if i thought 875 could have held (it was a strong MM /Fib level). ES 60mins: despite a fantastic recovery on Friday, our indicators show a possible exhaustion hence the forthcoming high should be lower than most recent ones, at least until new energy is added. We therefore anticipate a pause on the way to low 900s, possibly gathering strength on 875. The swing gradient also looks way too steep to be stable. ES Daily: we could be tempted to discard the last red bar as it closed near bar friday's high. MTFS line separation is also generally indicative of a lack of underlying forces to carry prices much higher. The bias is however still up and one could see ES hover or even rise a little still. Having said that, a retracement will be necessary at some point this week. ES Weekly: Entropy has now bottomed so we know prices are likely to recover even though in the usual seemingly chaotic environment. MTFS shows an early crossover, a blue bar and a recovering entropy could all lead to a scenario where price would head to 1000 (Fib + MM) by early January. We however don't anticipate that key level to be passed unless MTFS evolves into a more bullish pattern by then. 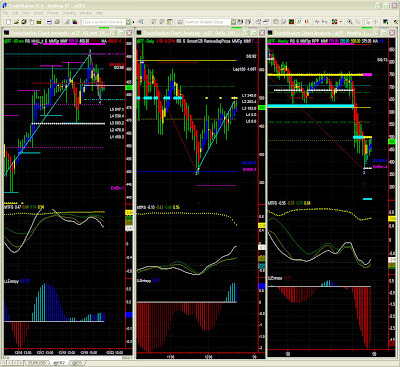 Dominant TF: 60mins with other time frames not far behind. While our outlook proved certainly right, we have to admit that volatility played tricks on us again last week, thus confirming the need for daily raport updates, and positions adjusted accordingly. EURUSD: last week's reports could not have been moe accurate on €/$. We advanced the move cautiously as the daily range could have held longer for another cycle. We are now on a short term resistance level which could slow down the current rise to ou 1.37 target. Profit taking is indeed expected down to the low 1.30s this week before marching higher. 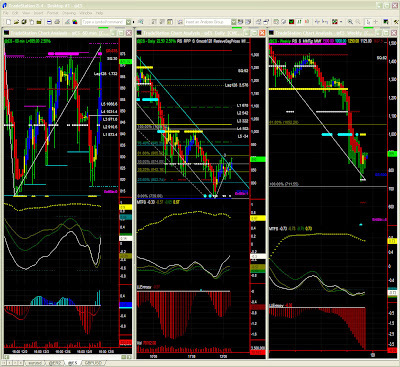 Having said that, the bias is still up so we'll wait for a confirmed downturn on the 60mins chart. ER 60mins: quite volatile indeed with a dramatic bounce on Fib/MM on friday as expected. ER is now heading towards Fib expansion target in the vicinity of the MM stall level (~490). This is also a range high where prices could certainly pause. ER Daily: Energy levels seem to be weakening ahead of 500 resistance level, here indicating again some hesitation. However the channel is confirmed broken so we can assume Fib PR1 will be hit this week. We shall however remain cautious about volatility spurt on coming triple witching day. ER Weekly: Entropy has finally bottomed which is good news, however the MTFS pattern seems to indicate a difficult bumpy recovery even though last week ended on a blue bar. 500 and Fib PR1 ~530 seem close enough but those levels are unlikely to be passed in the short term. €/$ broke out quite strongly and rose about all day. Not a single red bar until 7PM ! We can see that a provisional Fib Expansion pattern would take EURUSD to the highs mentioned recently. Let's wait for support for now though. ER: we turned to lower time frames as it hovered almost directionless on the 1H chart. WE have now retraced to a strong support level around 440 (MM + Fib) where it could and even should bounce. I have told several times on this blog that we are not heading for a smooth recovery (weekly entropy has not even bottomed yet), so we'll stick to lower time frames or remain very cautious. 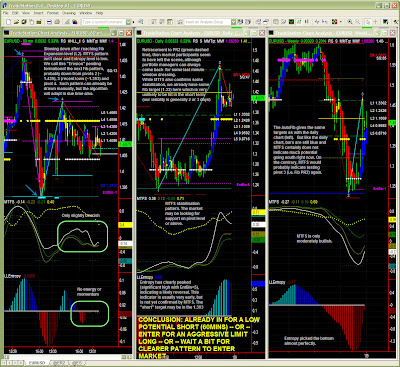 Great trading to all and see you monday for the weekly report. Where is the US$ going ... ? Same easy ride, with €/$ now reaching its target around 1.305. This is the high of the daily range so some profit taking is possible. Again the change in mindset is now visible and a range breakout could lead to 1.37 in a matter of a couple of weeks. We need to check behaviour on this key resistance level. EURUSD could retrace to 1.2966 or right down to pivot level to 1.293 which looks like a much better support level to then take prices higher. At this point in time (12:30 AM) bias is still up. A daily range of 17 points for ER almost looks like a calm day. We do see a mild upper bias, with prices hovering relatively high but could still go both ways. Maybe a good time to tighten stops. Exact same scenario for ES where we now see some hesitation after retracing up to the Fib PR2 level . We maybe need now a pullback to 875 to then attack the high 900s. Overall the bias is still up so one should just hang on and safely move stops to just below 875. A little more calm, a little more visibility at last. To the point to wonder whether an update today is necessary. ES completed its Fib expansion pattern and is naturally pausing a little. However, despite lack of energy here as well, there is more and more indication of a testing of 1000 within a few days. Does that mean it will go higher still then ? Well... the market needs more vitamins then. Certainly not visible right now. ER follows the same pattern and now has 500 in sight. ES also attempted a breakout and even passed 900 for a while. So, what's in store for today ? EURUSD is pausing on resistance level and could retrace a bit (Fib), yet the trend is now most probably up. After the initial pullback, we will wait for confirmation of a range breakout above yesterday's highs. ER should also see some minor profit taking today which will provide good entry points. ER should test 500 within a couple of days (Fib target ~490, then ~515). ES was inches away from stall level around 920 and is now gathering energy to reach the next 936 target. ES is certainly lining up to 1000 within a week or two. Something is brewing here... After another very volatile week, ES is attempting a recovery (breakout). What an amazing recovery on Friday afternoon !!! Despite the 875 level which should normally be tested for support we do have some evidence of a potential runaway situation. It is a difficult environment and to be honest, I myself have been rather following 16K and 32K volume charts lately. Alternatively, a lower time frame is recommended. 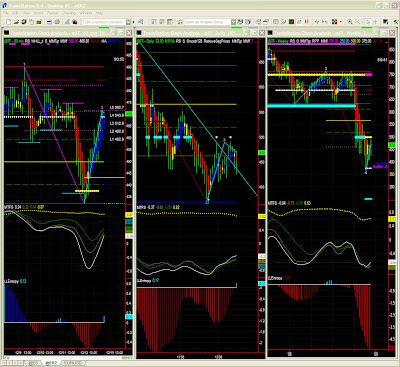 We will also make sure we take trades in the dominant trend given by a higher time frame. We do see signs of a recovery in the MTFS yet the pattern is not indicative an easy ride up so we should see a pullback possibly on 875 key level to provide enough energy to takes prices higher then. For the time being, we have to pass recent highs inches away from 900. Should those highs be passed, we'll check Fib levels on the way to 1000, but we'll remain very cautious in this volatile environment. Weekly: a blue bar ! Yes, like for ER, even if Entropy hasn't bottomed yet, even if MTFS is about stuck in oversold territory, even if Swing is desperately down... we have a blue bar ! It obviously doesn't mean much but we can get ready for a forthcoming turnaround. Oh well, we all know a swallow does not make a summer, but we might have a good week ahead of us. Daily updates will be posted on this blog. Last week i mentioned markets would be up overall and yet quite volatile. The situation is about the same now, except maybe that bigger players are ready to move in now more convincingly. We'll see that we still have a lot of volatility ahead, but the change in mindset we picked up last week will be more and more visible. EURUSD: €/$ is now aiming at 1.288 then 1.293. It could crawl higher even if ever so slowly, and despite the high volatility, we keep our target at 1.37 in January. 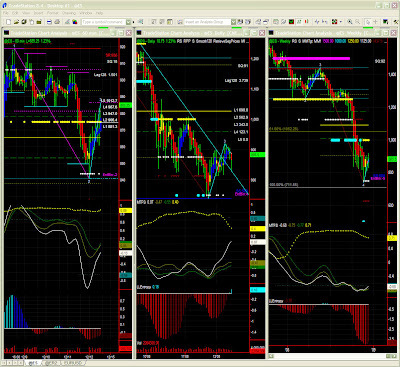 Over the medium term, we however do have a trading range with a pivot level ~1.27. We'll watch cautiously for higher support levels to confirm the current upper bias. ER is more or less back to the same price area we saw early last week, and the same target around 480 is still valid. We however notice swings being way to steep and MTFS reaching extreme levels again. We don't anticipate a smooth ride to 500 and consolidation will be necessary during the course of the day. Even if our long position has shown a pretty shallow take-off, we're believe that ER should reach its first target levels (480 then 500) where we will cautiously tighen our stops. We have a potential channel breakout and Entropy has clearly bottomed. MTFS however reminds us to be cautious, probably indicating some difficulty to pass our first resistance levels on the way to a clearer recovery. If 500 is passed and tested for support, we will update our targets (Fib/MM). The weekly chart shows little change from last week. Entropy hasn't bottomed yet, so we'll wait for another week or two at this time frame to see current prices stabilize. However we do notice a blue bar at last and a MTFS while still not looking great shows some upward inflexion now. We do still believe the worst (~380) is behind us but we may (and probably will) see some retracement when our first targets (daily charts) are hit. Behaviour on that key target area [480-500] will however determine market direction for at least 4 to 6 weeks. We do start plotting Fib target areas in case of a breakout. We are not at a decision point yet at this time frame, so we'll have to review our scenario next week. ON ACCOUNT OF THIS EXCEPTIONAL MARKET SITUATION, DAILY UPDATES ( --- EXCEPT FOR TOMORROW TUESDAY --- ) WILL BE POSTED ON THIS PUBLIC BLOG THIS WEEK AGAIN. ER also crept higher, although unconvincingly, so the following retracement was very much expected. Here again we are looking at a support in the current area although we'll keep an eye on an alternative support around 423 if 437 breaks. ES was kind enough to behave and reach spot-on our resistance level before retracing. It could try and reach ~870 again to attempt a breakout north. Conditions don't seem right just yet though, but we'll be watching. OK, yesterday was a bit of a toss of a coin on pivot level, and it could really have gone both ways. The market chose to go up (that was my smart guess also), even if this still looks rather unconvincing. Volatility is still very strong and coud cause more wild swings in the coming days. EURUSD is certainly looking bearish, so we'll keep this as a sign of more deleveraging and flight to safety in progress, even if the logic would be for the $ to weaken eventually. In the short term, 1.256 - 1.257 is a strong support level. ES follows a similar pattern, and also has a strong hurdle along the way to recent highs. Indeed Fib and MM levels show a resistance level around 873 to 875. We'll therefore be very cautiously positive today. Sorry i missed some action on Monday. I spent about 16hours in a plane and Internet above 30000ft when available is outrageously expensive. I remember saying we should not pay too much attention to the rise late last week. ER rtraced a little quicker and stronger than anticipated, but we all know volatility exacerbates movements and support was found close to Fib PR2 above 410. Similar scenario for ES. So, what do we read now? Same dynamics as for ER although a little more contained. It is difficult to say whether one should take volumes too seriously for the 2nd part of last week as it seems ES has been gliding a little too high and may fly through a air pocket now. Despite being overbought, we foresee no change in the overall bullish sentiment. We just have to check where support will be tested, possibly in the 875 area, or a 1st Fib level below. Obviously the MTFS recovery is a big question mark but a channel breakout could trigger some buying to the 1st Fib level (~960). We do not anticipate it just yet and some consolidation is more likely. Again, even if the worst is probably over, we shouldn't too bullish too quickly at this time frame at least. Weekly: inches away from Fib target. Here as well, one should certainly NOT aim at a quick turnaround and start buying frantically already. The situation is similar to the daily chart i.e. bearish and at the same time very oversold. Like for ER, we shall wait a couple of weeks and maybe until January to confirm a reversal even if we do not anticipate more than a crawling back to former higher over at least one year. Last week was short but bullish nonetheless, and we are definitely seeing a possible change in mindset, at least justifying trying going long. ER is now aiming at 484, last step before attacking 500. Let's see whether we have a good plan of attack, with a first look at €/$. EURUSD: €/$ reached a target we gave last week, and could have then tested further levels, ~1.33 etc. It instead stayed in the same channel, hovering near a support level around 1.27. Indicators are not showing much energy just yet, even we reiterate that the $ must weaken eventually (weekly chart). 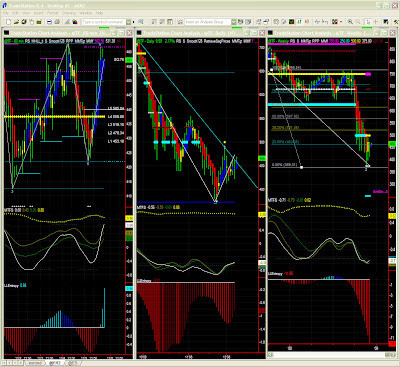 We will therefore watch the daily channel as well as the price segments. €/$ can indeed crawl back to last week's highs or break current 1.27 to test October lows again. At the moment, a first bounce is likely, until energy picks up to weaken the $ over current resistance levels. At this point in time, and maybe due to the short week, energy seems to be lacking to take ER much higher. We do notice the ~380 lows have turned to very strong MM support level. Pivot level (~440) held for a while before the long weekend, but weaker volumes may indicate that that same pivot level could be tested again for support later on. For the time being we still give the upper bias a chance to hit 484 before retracing. we had our entry point last week with a controlled risk as we placed our stops below recent lows. Our indicators do show a definite change in market sentiment so while volatility is remaining high, we are slowly turning bullish (Entropy bottomed up and MTFS show positive gradients in oversold territory). We are here also aiming at 484 then 500 as test levels going forward. Again, we do not anticipate a smooth ride and a return to the 440s or at the very leat the lows 460s is quite possible. Entropy could bottom soon if we project current trend (1 week or 2). However we don't have a MTFS conducive to a decisive recovery yet. For the time being, we'll follow the scenario of a weak bounce. We may have some XMas buying or a January bargain hunt once 2008 books are closed out. Conservative long term players should at least wait for a blue bar at this time frame.